In central Alaska, just off the George Parks Highway, there’s a popular packraft trip called the Coffee to Pizza traverse. Originally pioneered by Ed Plumb, the trip is an overnight loop from Carlo Creek, where a cafe and pizza place sit a stones throw apart. You start with a coffee, then a roughly 15 mile hike up the Carlo Creek drainage. You cross a high pass and descend to the Nenana River to float the same around number of river miles back for celebratory pizza and beer. Red = biking route to the put-in. The river completes the loop. At least, that’s the idea. When I did it this summer a late start, lost paddle, lightening storm, hail and series of navigation mistakes turned it into a no-coffee-no-pizza traverse that involved an extra night out with no food or fuel. So, being the slightly un-balanced human I am, I decided this past weekend was the perfect time for redemption. Enter, the Squamish Coffee-Pizza Traverse. The idea of this trip was to link up – in my opinion – the best breakfast and the best pizza in Squamish via a novel, overnight packrafting trip. Like the Alaskan version, it had to start and finish in roughly the same place, cover similar distance by land and river, and be, theoretically at least, an overnight trip. As I pored over topo maps, I decided to make one amendment. My version would include bikes. And so, early on a hot September morning, I headed up to Squamish to try and bike-raft around Cloudburst Mountain. We left Vancouver early Saturday morning, drove up the Sea to Sky Highway and parked near Backcountry Brewing, a new-ish brewery/pizza joint in the industrial part of Squamish. From there, we loaded our gear onto bikes – paddles extending behind our seats like poorly designed wings – and set off north towards Brackendale. We started peddling shortly after 7:30, following Government Road to where it becomes the Squamish Valley Road and then the Paradise Valley Road. We stopped just before the Cheakamus River at Fergie’s Cafe, the coffee (and breakfast) portion of the traverse. After a leisurely breakfast, coffee and more coffee, we hopped back in the saddle and continued riding up the Paradise Valley Road, past where the pavement ends, past where the gravel gives way to a service road, and eventually to where the road dead ends at the Sea to Sky Trail. From here, the trail, mostly loose gravel double-track, climbed up and out of Cheakamus Canyon, looking down at stunning views down at the Class IV-V whitewater below, passing a small trailside lake for a morning swim break and crossing a mandatory bike portage section over concrete blocks and across CN rail tracks. We exited the canyon near the climbers trail for Star Chek – a bolted three pitch route that climbs up from the canyon floor – and breezed a quick 5 km along the Sea to Sky Highway to the turnoff for the Chance Creek Forest Service Road. The view down to the Cheakamus. We stopped for lunch just across the bridge over the Cheakamus, where most people park to walk up to Lake Lucille and where some kind soul handed us two ice cold beers. As the story goes, some one handed him a cold beer in the midst of a long bike tour some years past and now, any time he sees people in a similar situation, he pays it forward. We may have only been a few hours into our trip, but hot and dusty as it was, I wasn’t about to argue. After lunch we started up the Chance Creek FSR, a long gravel grind up switchbacking logging roads into a popular winter snowmobile zone. We passed clear cuts, an abandoned camper, a small lake hidden down an unmarked side trail and a few pull-out campsites. Behind us, Black Tusk and the peaks of Garibaldi Park struck stark relief against the late summer afternoon sky. The view back towards Garibaldi Provincial Park. The road surface deteriorated the higher we climbed. And after a couple hours, we started getting close to the biggest unknown of the trip, a gap, somewhere between 500 meters and 2 kilometres, between the end of the Chance Creek FSR and the start of the High Falls FSR on the other side of Cloudburst Mountain. Eventually, the road disappeared, and we pushed our bikes up a steep, uneven dirt slope, crunching dry sticks beneath our feat and weaving our tires through downed trees and scattered rocks. The track levelled out, not a trail or a road, but a wide, brush-cut section of that looked like an elephant stampede track. In the winter, it might be a snowmobile or cat track, but in the summer, it was a grinding hike-a-bike. Crossing the gap between the two logging roads. Thankfully, it was on the short end of what I expected – only about 500 meters. On the far side, you could make out a beautiful view of the still-snow covered peaks of the Tantalus Range just above the trees. It was getting close to sundown as we started our descent, So, low on water and energy, we found a campsite in gravel pull-out a couple kilometres down, just past where the road crossed High Falls Creek. It wasn’t a scenic campsite, but it was close to water and big enough that we could pull well off the road. We cooked, set up camp and ate dinner just as the sun dropped behind the mountains. The next morning we woke up with the sun, brewed some coffee and reloaded our bikes for the descent to the Squamish River. 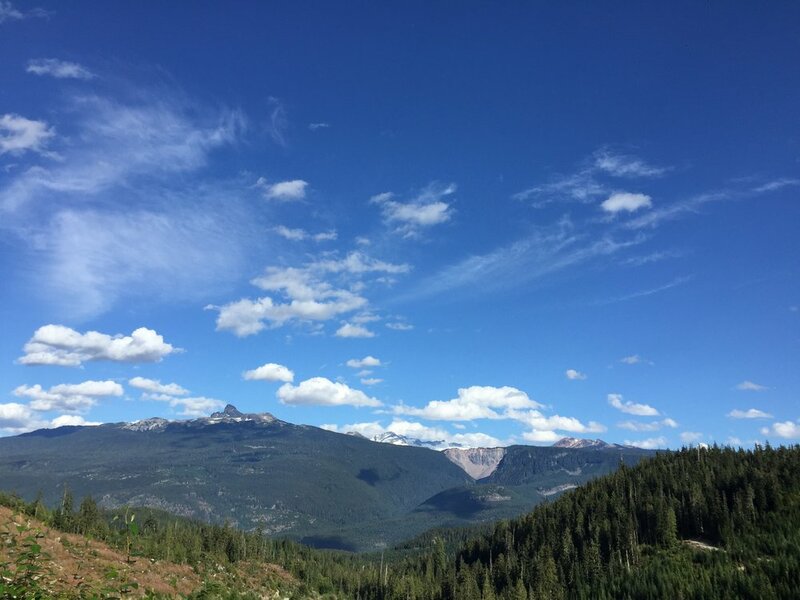 The road quickly plunged down through a series of steep, loose and rocky descents before emerging on a series of switchbacking ridges with a panoramic view up the Squamish River towards it’s confluence with the Elaho. First view down the Squamish River valley. 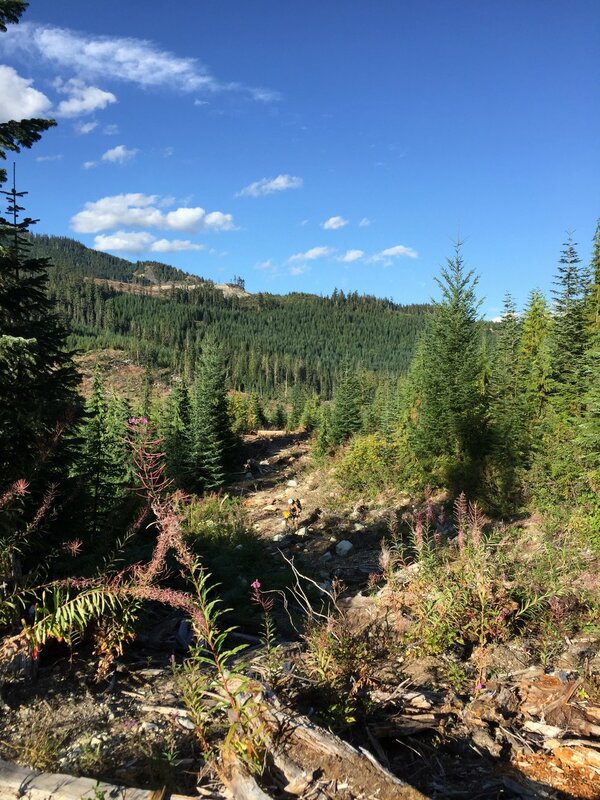 The descent was quick and fun on big 29-inch mountain bike tires, but the loose rock and steep grades were challenging for a gravel bike. In sight of the river. We arrived at the river around 10:30, our transition from rafts-on-bikes to bikes-on-rafts drawing a mix of confused looks and thumbs up from drivers headed up the road for their own adventures. 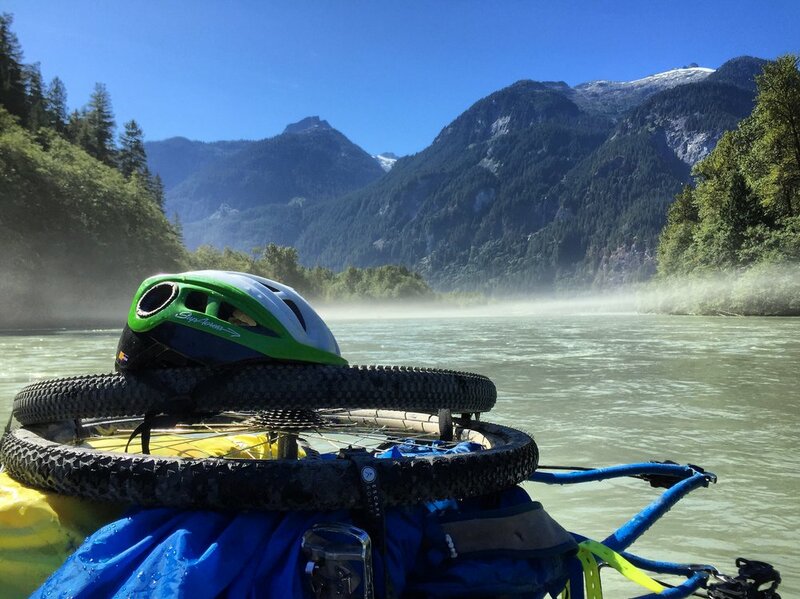 Boats inflated and bikes disassembled and strapped down, used a small fishing trail to put in on a flat-water slough just below the road where the High Falls FSR meets the Squamish FSR and paddled out towards the main flow of the Squamish. Paddling out of the put-in slough. From this put-in, we were below all of the Class III rapids on the Squamish, and our major concern was wood. Enormous log piles washed downstream in past floods were visible from high on the ridges we had biked down, and paddling closer to the flow, the sound of large volumes of water crashing into them was un-mistakeable. From our slough, we had to enter the river as high as possible, point upstream and ferry across the main flow to avoid a massive strainer below as the Squamish made a sharp river-right turn out of the gates. Past this, the river remained a fast, high volume Class II until we reached the bridge beside a popular BC Parks campground near where Ashlu Creek drains into the Squamish. There were a few wave-trains, but no major rapids or holes at the current flow rate. The river flattened out a short float past the bridge, and apart from the occasional log in the river, the main hazard became a sunburn. We paddled a bit, but mostly floated and stared up at the peaks as the river wound it’s way down the valley towards the sea. It was easy paddling, but boring at times, and I was grateful when, after at least two hours of slow water, we passed Tantalus Provincial Park and the river picked up speed. Below the bridge, onto the flatter section. From here, we floated past Brackendale Eagles Provincial Park, past confused fisherman, and were joined by some curious seals who had followed the salmon run up the river from Howe Sound. The river was faster, but still easy with a couple small wave trains and some wood. The main hazards from here down were jet boats headed upstream, fishing lines near the shore and the bodies of dead salmon floating in the river. Waterfall a few kilometers up-river from Tantalus Provincial Park. Just outside of Squamish, we saw a large black bear picking it’s way along the rocky riverbank. It paused and stared as we floated past, pawing the water and seeming to consider the idea of jumping in to swim after us. We pulled out where the Mamquam River enters the Squamish at around 4:30 p.m., confusing more beach-goers as we re-assembled bikes on the rocky beach, deflated our rafts and hiked our whole kit back up towards the road. One wrong turn and fifteen minutes later, we pulled up to Backcountry Brewing, sunburnt, dehydrated and famished. Another twenty minutes after that, we devoured two pizzas. While you can do this route on a gravel-grinder, I would recommend a mountain bike. Both the logging roads and the Sea to Sky trail have some very loose and rocky sections that are just too much for something without big, burly tires. If you do choose to take a gravel bike, pack it so it’s easy to hike-a-bike. The Squamish is a big, fast river and the wood hazards from the put-in to the bridge could have serious consequences, especially with a bike on your raft. If you’re worried, you could easily just bike down to the bridge and start the float from there. Conversely, if you want to run some gnarlier rapids, you could ride further up-river. Keep in mind, this trip was done on Labour Day weekend after a long dry spell, make sure to check the river level before committing.